In a Nutshell: The implementation of mandatory comprehensive credit reporting (CCR) legislation is underway in Australia, meaning consumers will likely see changes in their credit reports. For many, this change will be a good thing, since positive payment histories will now factor into their credit scores. But knowing a number and understanding how it impacts your life are two different things. Already known for providing free access to credit scores from Equifax, Australia’s leading credit reporting bureau, GetCreditScore, goes further by helping consumers better understand credit and personal finance, as well as the impact of CCR. Through additional resources in its help center and blog content, GetCreditScore empowers Aussies to improve their financial well-being so they can qualify for more favorable credit products. Australia has long had a problem with negativity. Before you grab the pitchforks, know that we’re not talking about attitudes; instead, we’re referencing the credit reporting situation. And also know that it’s getting better thanks to comprehensive credit reporting (CCR). Prior to the required implementation of CCR in mid-2018, credit histories were dominated by negative marks like defaults and overdue payments. But thanks to new legislation, credit profiles must now also include positive financial information like histories of timely repayments. This practice helps lenders get a more accurate picture of a borrower’s risk. And most consumers will benefit by having positive financial practices count in their favor instead of simply only having negative information counted. Although mandatory CCR is common in other parts of the world, it is still being introduced in Australia. Implementation is expected to be complete by the end of 2019. To help Aussies better understand CCR’s impact on their credit reports, GetCreditScore is providing informational resources on all things related to credit and personal finance. GetCreditScore allows consumers to gain access to their Equifax (formerly Veda) score in about 60 seconds. And unlike some credit checks, GetCreditScore’s free service won’t negatively impact your credit score. All personal and financial information is protected by identity checks and encryption, so users can access their scores without having to worry about getting dinged. While knowing your credit score is important, it’s even more crucial to know the options it creates. Through its partnerships, GetCreditScore offers deals on credit cards, health insurance, and personal, home, auto, and business loans. The site’s help center and blog offers educational resources that help Aussies use these products to their advantage while maintaining and improving their credit. In the case of CCR legislation, this includes understanding how new mandates are affecting their credit histories. With this knowledge, a consumer will be able to put his or her best financial foot forward when shopping for loans, cards, and other financial products. So what goes into a credit score? Australians’ Equifax credit scores range from 0 to 1,200. Individual scores are calculated based on information included in a consumer’s credit history. Credit inquiries within the last five years make up 51% of the score; a larger number of checks and applications for products can indicate a greater need for credit and therefore greater risk, causing this facet to be weighed more heavily than all of the others combined. The length of credit history, credit limits, and personal information account for 3% each; a payment track record, the amount of credit extended by other lenders, as well as a person’s age and stability of employment and residence are all important considerations for lenders. Another 10% of a score reflects adverse credit events like overdue debts, default, court writs, and bankruptcy. The remaining 30% is made up by a consumer’s repayment history, which reflects the new CCR requirement. All of this information is distilled into the number you see when you check your credit score. Values between 0 and 509 are considered below average, and average scores extend from 510 to 621. People with scores between 622 and 725 are considered to have good credit, with 726 to 832 being very good. Consumers with scores between 833 and 1,200 should take a moment to pat themselves on the back because they have excellent credit. When shopping for loans or credit cards, a score that’s good enough for an auto loan may not be good enough for a home loan, and a score that’s acceptable for one lender may be too low for another. To enjoy the best product offerings, consumers must establish and maintain high credit scores. For those who want to delve deeper into the details of personal finance, GetCreditScore provides additional information in its help center and blog articles. In the help center, readers can discover more about obtaining, understanding, and improving their credit profiles through practices like timely repayment and responsible use of credit. GetCreditScore’s blog articles go more in-depth on the same topics featured in its help center’s summaries and FAQs. Readers can also learn about products, such as insurance and savings accounts, and the social aspects of credit — like how financial behavior can impact the financial future and welfare of their spouse or partner — and read financial news, including updates on CCR implementation and its effects. Among topics covered on the site is the concept of improving your credit score through disputing errors on your report. Reporting bureaus handle a high volume of information, and mistakes do happen. By comparing your reported credit history with your own records, you can catch these errors, have them corrected, and raise your credit score to what it should be. Also, it’s important to make sure that all bills are paid in full and on time. Under CCR, payment records now account for a substantial percentage of a score. Simply by making timely payments, consumers can realize a positive upswing in their credit score. “Thanks to the introduction of comprehensive credit reporting, paying your bills on time, every time, will go a long way to improving your credit score,” Smith said. CCR ensures that, in addition to negative marks, credit histories now also contain positive information about credit accounts and repayment histories. This allows lenders to achieve a more complete picture of a consumer’s financial situation. It also means that consumers’ credit scores may change, altering each individual’s eligibility for products and services. 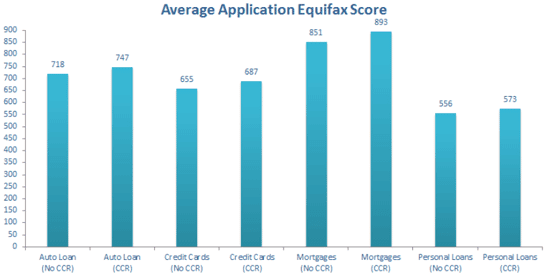 GetCreditScore reports that, as of late August 2018, 40% of the retail credit market has supplied the required data to Equifax. Some 7.3 million Australians’ records now include CCR information. As a result, 1.5 million people who had no credit history now have one. Many consumers who were high and medium risk have dropped to low risk, thanks to the positive information now taken into account. Keeping tabs on your credit score and history is a good way to ensure both are up to date and accurate. This practice, along with other debt management tactics, like those suggested by GetCreditScore, provide long-term benefits for consumers. By diligently maintaining a good score, consumers can enjoy more competitive products at lower costs and more desirable terms. No matter what their need, this access will help them secure financial stability and success now and in the future.